charmcityartsmaven: “TAMING OF THE SHREW” OPENS @ BALTIMORE SHAKESPEARE FACTORY THIS FRIDAY NIGHT! “TAMING OF THE SHREW” OPENS @ BALTIMORE SHAKESPEARE FACTORY THIS FRIDAY NIGHT! 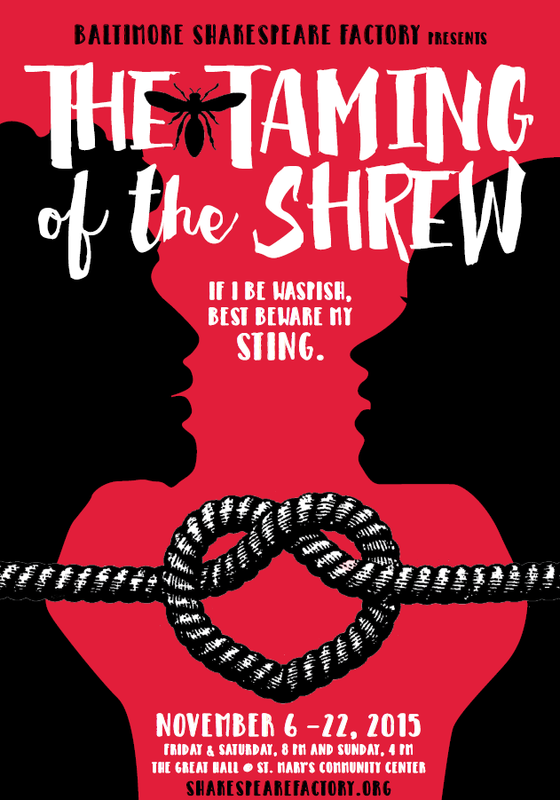 "The Taming of the Shrew" tells the story of the unconventional romance between a lusty fortune-hunter and a feisty, sharp-tongued daughter of privilege. Every man in Padua wants to marry the beautiful Bianca, but her father will not allow her to wed until his eldest daughter, Katherina, has a husband. Too bad every man in Padua is terrified of her... that is, until Petruchio comes to town. BSF's 2015 season closes with a bang as the two unlikely lovers battle their way to happily ever after. This is also our Actor Ensemble Experiment. We spend only five days rehearsing before opening night Friday—and if we screw up, we want the audience to throw tomatoes (yes, literally... you can rent foam tomatoes at the box office). We're proud to be a part of Charm City Fringe Festival again this year. Tom Delise founded the Baltimore Shakespeare Factory in 2006 and is the artistic director of the company. He received a BA degree in English from Brockport University and a master’s degree in liberal studies from Towson University. For the Factory, he has directed the historic production of The Merchant of Venice in original pronunciation, The Taming of the Shrew, Twelfth Night, The Comedy of Errors, Much Ado About Nothing, As You Like It, Macbeth, Love’s Labor’s Lost, Romeo and Juliet, Hamlet, Richard III, Measure for Measure and co-directed A Midsummer Night’s Dream with Chris Cotterman. He has also directed a staged reading of The Famous Victories of Henry V, performed at the American Shakespeare Center. Delise has been a high school teacher for over thirty years and is the author of the book, That Is the Question: The Ultimate Shakespeare Quiz Book.